Open source technology encourages collaboration and innovation to address real world problems, including projects supported by Google Cloud. As part of our broad engagement with the open source community, we’ve been working with HashiCorp since 2013 to enable customers who use HashiCorp tools to make optimal use of Google Cloud Platform (GCP) services and features. Google and HashiCorp have dedicated engineering teams focused on enhancing and expanding GCP support in HashiCorp products. We’re focused on technical and shared go-to-market efforts around HashiCorp products in several critical areas of infrastructure. Cloud provisioning: The Google Cloud provider for HashiCorp Terraform allows management of a broad array of GCP resource types, with Bigtable and BigQuery being the most recent additions. Today, HashiCorp also announced support for GCP in the Terraform Module Registry to give users easy access to templates for setting up and running their GCP-based infrastructure. We plan to continue to broaden the number of GCP services that can be provisioned with Terraform, allowing Terraform users to adopt a familiar workflow across multiple cloud and on-premises environments. Using Terraform to move workloads to GCP simplifies the cloud adoption process for Google customers that use Terraform today in cross-cloud environments. 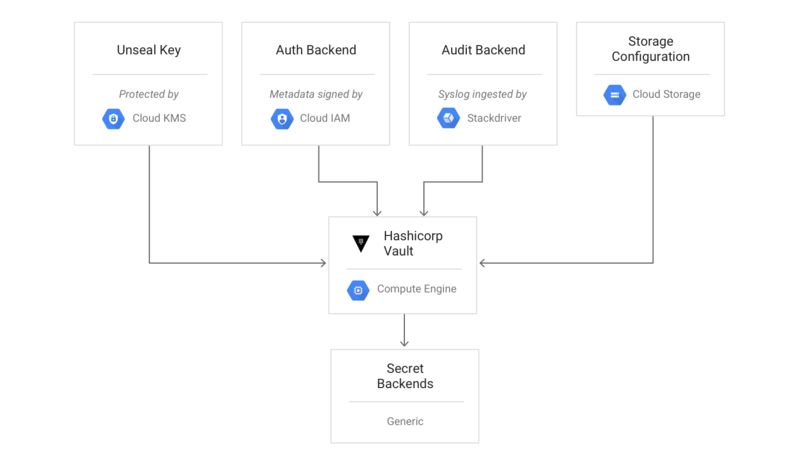 Cloud security and secret management: We’re working to enhance the integration between HashiCorp Vault and GCP, including Vault authentication backends for IAM and signed VM metadata. This is in addition to work being done by HashiCorp for Kubernetes authentication. Applications often require access to small pieces of sensitive data at build or run time, referred to as secrets. HashiCorp Vault is a popular open source tool for secret management, which allows a developer to store, manage and control access to tokens, passwords, certificates, API keys and other secrets. Vault has many options for authentication, known as authentication backends. These allow developers to use many kinds of credentials to access Vault, including tokens, or usernames and passwords. GCP IAM service accounts: a new Google Cloud Platform IAM authentication backend for Vault allows you to use an existing IAM identity to authenticate to Vault. Google Compute Engine instance identity tokens: announced today, this uses an instance’s signed metadata token to authenticate to Vault. With these authentication backends, it’s easier for a particular service running on Google Cloud to get access to a secret it needs at build or run time stored in Vault. Fleetsmith is a secure cloud-based solution for managing a company’s Mac computers, that fully integrates with G Suite. They’ve been testing out the new Compute Engine metadata backend, and are currently using Vault on GCP for PKI and secret management. Learn more about how Fleetsmith did this in their blogpost. If you’re using Vault for managing secrets in Kubernetes specifically, today HashiCorp announced a new Kubernetes authentication backend. This uses Kubernetes pod service accounts to authenticate to Vault, providing an alternative to storing secrets in directly in `etcd`. You may already be running your own instance of HashiCorp Vault. Users can run Vault in either Compute Engine or Google Container Engine, and then use one of our new authentication backends to authenticate to Vault. Today, we’re publishing a solution on how to best set up and run HashiCorp Vault on Compute Engine. For best practices for running Vault on Compute Engine, read the solution brief “Using Vault on Compute Engine for Secret Management”. When you’re testing new code or software, you might want to spin up a test environment to simulate your application. HashiCorp Terraform is an infrastructure management and deployment tool that allows you to programmatically configure infrastructure across a variety of providers, including cloud providers like Google Cloud. Using Terraform on Google Cloud, you can programmatically manage projects, IAM policies, Compute Engine resources, BigQuery datasets and more. To get started with Terraform for Google Cloud, check out the Terraform Google Cloud provider documentation, take a look at our tutorial for managing GCP projects with Terraform, which you can follow on our community page, or watch our Terraform for Google Cloud demo. Google has released a number of Terraform modules that make working with Google Cloud even easier. These modules let you quickly compose your architectures as code and reuse architectural patterns for resources like load balancing, managed instance groups, NAT gateways and SQL databases. The modules can be found on the Terraform Module Registry. We’re always excited about new contributors to open source projects we support. If you’d like to contribute, please get involved in projects like Kubernetes, istio, as well as Vault and Terraform. The community is what makes these projects successful. To learn more about open source projects we support, see Open Source at Google. Previous: GCP arrives in South America with launch of São Paulo region!